Atlanta-based Turnkey Construction & Roofing (Turnkey) recently partnered with the Atlanta Community Food Bank (ACFB) to help feed Atlanta families in need. Other companies who participated in the day include Bank of America, Impact Church, The Jr. League of Atlanta, Dismas Charities and UGA. “We are dedicated to our customers but also committed to our community,” said Deanna Navarro-Ek, president, Turnkey. “We can’t think of anything more important than feeding 300 families in need and were very grateful to be able to help,” she added. 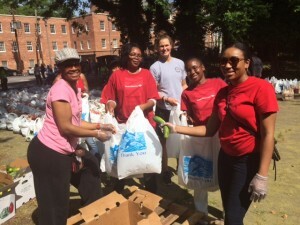 Founded in 1979, ACFB procures more than 60 million pounds of food and groceries each year and distributes it to more than 600 nonprofit partner agencies serving families and individuals in 29 metro Atlanta and north Georgia counties. ACFB utilizes more than 1,700 volunteers a month, over 150 staff members, a large fleet of trucks and a 129,000 square-foot facility to procure and distribute food and grocery items received from hundreds of donors. For more information on the Atlanta Community Food Bank and our projects, contact info@acfb.org or (404) 892-9822. Turnkey Construction & Roofing is a woman owned business headquartered in Atlanta, Georgia, that provides engineering, construction and roofing services throughout the greater Atlanta area. The team consists of professionals have more than 50 years of experience in commercial and residential construction. Turnkey offers a comprehensive list of services from the simplest to the most complex of general contracting services within the residential and commercial markets. More information can be found at http://www.turnkeyga.com.